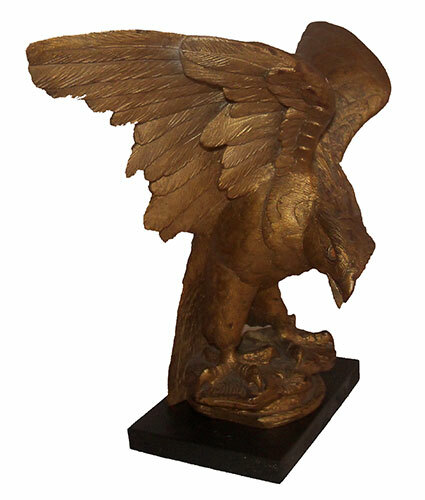 Presented here, a wonderful Folk Art Carving of a gilded Eagle. No matter how you look at this piece, you can't help but be impressed by the artistic balance and attention to detail in the feather carvings to the mighty talons clutching the rocky perch. Height is 12 inches . . . Wing span is 14 inches. It is mounted on a later wood plinth. It has a wonderful patina that only age and time will impart. Condition is excellent. Most Folk Art, by its very nature, is anonymous. It is the work of people, not names. 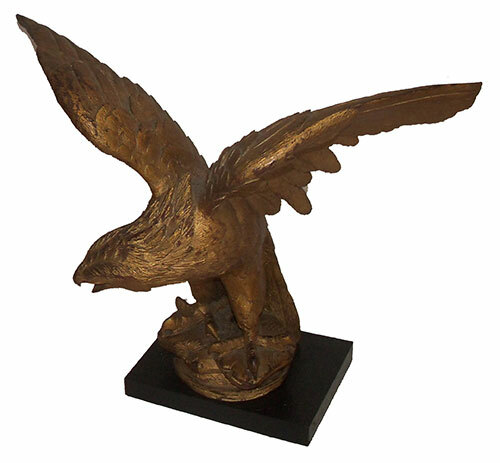 This artist obviously understood the "essence" and the majesty of the bird and, under his capable hands, brought the carving to life. For that is the very essence of Folk Art . . . the ability to capture the essence of an object which is its life, to freeze it in time and then release it when someone looks at it 100 or more years later.